As recently as 1960, Napa Valley was a sleepy backwater, planted mostly to apple orchards and not much on anyone’s mind, much less anyone’s wine map. A scant sixteen years later, Napa went on the entire world’s wine map literally overnight following the “Judgment of Paris,” a wine tasting organized to help a modest Paris wine retailer – a Brit, in fact – build his business. More about that in the Wine-Flair Wine FAQs. In 2007 Napa is the premier location for American wines and wineries, and its mystique and promise have brought great french winemmakers, Silicon Valley millionaires, rock stars, and tens of thousands of poor itinerant laborers from Mexico. It’s not really a big place, and in the high season a mediocre B&B will run you $350 a night. You also risk spending more time than you’d like crawling up and down route 29, battling legions of wine tourists. Having said all that, if you’re interested in wine it’s a place you can’t miss at least once. And once you’ve been there, you’ll promise yourself a trip back. All my trips to Napa or Sonoma start with a visit to Gloria Ferrer Champagne Caves at the south end of Sonoma, actually in the Carneros American Viticulture Area (AVA). Before I make that right turn at the “big bend” blinking light onto the Carneros Highway, I stop here and enjoy a glass, or several, of some of the best domestic bubbly you can find. In fact, the photo at the top of my website was taken from the terrace at Ferrer. I’ve never taken a tour there – although I’ve spent some time talking to winemaker Bob Iantosca – because I don’t want to leave that terrace, where they serve wonderful roasted, spiced almonds and their tremendous Blanc de Noirs non-vintage. Iantosca, like a lot of other winemakers at sparkling wine places, is dabbling in some still wines, but you shouldn’t bother with them: Ferrer’s sparkling wines are outstanding across the board and they’re the only reason to visit. 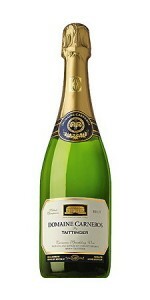 Also try the 2003 Brut Rose, which is pretty much available only at the winery. It is wonderful. A creature of habit (which can be a bad thing in a wine aficionado), my second stop on the way to Napa is always Domaine Carneros, in the heart of the Carneros AVA. Their intention, clearly, is to create a winery that is known for its still wines as much as sparklers, and that’s a tall order: their sparkling wines are solid but not as good as Ferrer to this taster. And they’re far from the quality and nuance of Schramsberg. Still, you’ve got to wish them well. And hey, stop here anyway – you can pretend you’re visiting a French chateau, and there are no guillotines to be seen. They’ve also got an excellent if over-dramatic tour that begins with a short film explaining Taittinger’s history across the pond. And when the bottling line is open, the rest of the tour is both enjoyable and educational. It’s interesting, at least to me, that both winemakers here are women, especially at a sparking wine house owned by an historic French company. Take that, Sarkozy. One caveat: Domaine Carneros limits patrons to two glasses each of their wines or sparkling wines, so don’t plan to sit and sip glass after glass no matter how much time you have or how lovely it is on the terrace. Now, plenty of folks including a lot of wine writers, travelers, and self-appointed architecture critics love to make fun of the winery, a full-scale replica of the 18th century Chateau de la Marquetterie owned by principal founder Champagne Taittinger. But if this large winery is out of place, then so are many other Napa wineries. So when you visit, just enjoy yourself on the large terrace – one of the few wineries that offer table service – and leave the architecture criticism behind. They’re open 10:00 a.m. to 6:00 p.m. daily. Well now that we’ve established that I like to visit certain wineries again and again, every time I’m in Napa I get off the rat-race of Route 29 and visit my friends the Corleys of Corley Family Napa Valley Winery, also known as Monticello Vineyards. And I’m pleased to tell you that I can and do maintain my objectivity about their wines (many of which are outstanding) even while I appreciate the hospitality they show me when I’m in town. Jay Corley founded Monticello in the late 60s, and was a founding member of the Napa Valley Vintners Association. His sons Kevin, president, Chris, winemaker, and Stephen, director of sales, run the place just like the family they are. They probably bicker like brothers, too, although I’ve never seen it, and when I visit they are rarely in the same place at the same time. That is the wine business. As I walked into the vineyards with Kevin, he talked sincerely and at length about how they’ve stayed with their dad’s vision of small lots and truly handcrafted wines. And you can do that when you make only 15,000 cases, which is small by almost any standard, and truly tiny in Napa. They produce three lines – Corley, Corley Reserve and Monticello, and all their fruit is sourced from their own vineyards, with the Pinot grown right behind the Jefferson house, shown here. If you went north, you’d also come across their wholly-owned vineyards first on State Lane in Yountville, then Neibaum Lane in Rutherford, and finally Ehlers Lane in St. Helena. Speaking of the Jefferson House, this replica is two-thirds the size of the original in Virginia, and pays homage to that founding father’s love of and appreciation for wine. 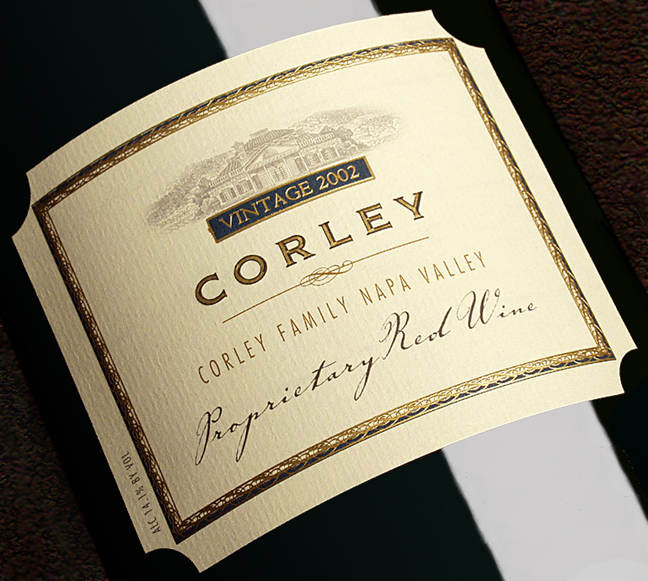 My favorite Corley wine is the Corley Proprietary Red Wine 2003, made with an unusually large percentage of Cabernet Franc (about 55%) and the rest divided between Merlot and Cabernet Sauvignon. I’m also very fond of their rich Merlot, and that’s saying something since I rarely drink it as a varietal. 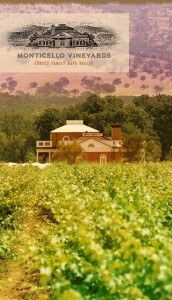 Monticello/Corley Family Winery is open daily from 10:00 am to 4:30 pm. V. Sattui (the V is for Vittorio, who first established the place in the late 1800s. His great-grandson Darryl reestablished it in ’75) is a large, fun winery right along Route 29 just north of St. Helena. They’ve got a great picnic area where you can sit in the sun, eat some cheese, bread and olives from their Deli, and wash it all down with a bottle of red, white or rose that they’ve just pulled for you. In my view Sattui wines aren’t exceptional in any way, just competent, but they have a nice selection of wines including some that most Napa wineries don’t – an excellent Gamay Rose, and both dry and off-dry Rieslings. Tastings here are free, a rarity in Napa these days, and Sattui wines are sold only at the winery, so you’re part of a very exclusive club when you’re here. Although there are more than two acres of picnic areas, the place fills up fast during high season and can get very crowded. I suspect that the free tastings have something to do with that, but so does the friendly staff, and they really are nice. 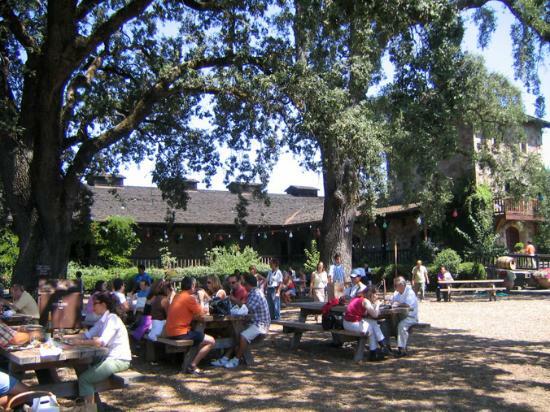 Sattui has a large parking lot and tour buses take full advantage…but this is a place you must visit; it’s just too much fun. They’re open 9-5 in winter and till 6 pm in summer. The end of the line for me in Napa is typically Bennett Lane in Calistoga, north of, actually. 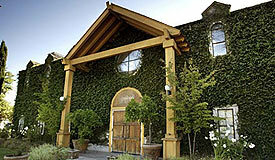 Owners Randy and Lisa Lynch purchased the property in 2003, choosing Napa because of their love of Cabernet. Randy is a NASCAR guy and the winery sponsors a team, so if you’re into that you can get your fill – what with a car in the barrel room, racing photos everywhere and merchandise for sale. I’m an open-wheel SCCA man myself and I think the NASCAR stuff is a bit overdone in any event. But having said that, I really like this place, the people, and the wines, and you will, too. I came for the Maximus my first time – a scrumptious blend of Cab, Merlot, and yes, Syrah (20%), which is a rather unusual mix in this part of the country. As I walked into the small tasting room I was greeted by Keith Hargrove, the national sales manager, who’s really the Ambassador of Bennett Lane to the wine-drinking world. Keith, who often mans the tasting room when he’s in town, spent the better part of two hours walking me through their selections, topped off by a barrel tasting of some unreleased wines. Together we tasted and compared the 2002 and 2004 vintages of Maximus, which were noticeably different although they have mostly the same proportions of varieties. And while their Chardonnays do little for me (I am a real hard sell on California Chards), the Bennett Lane White Feasting Wines are outstanding, made primarily from Sauvignon Blanc but with a few percent Chard and couple percent Muscat as grace notes. For my money, Randy Lynch really scored when he brought Rob Hunter in as winemaker. Rob is a former Vice President and Director of Winemaking for Sterling Vineyards and before that was winemaker at Markham Vineyards, and Lyeth Winery. The wines really show not just care – every winemaker in Napa “cares”, after all – but a philosophy put to the taste. I walked out with several bottles of Maximus, and I’ve stayed in touch with Keith for the last couple years. I’ve also bought a 3 liter Maximus in an etched bottle, which lends a noble Roman character to my wine table. Ironically, though, Maximus was a Spaniard from a small town in Galicia…so shouldn’t this wine be made from Mencia or Garnacha? Heading north on Route 29, I often take the Yountville exit, cross the “Wine Train” railroad tracks, and drive the short distance up a hill to Domaine Chandon. Most of the time that also means a leisurely lunch at the winery’s Etoile restaurant, outside on the terrace. They’ve got a nice tasting menu, the cheeses and caviar are excellent, as is the service, and if the weather’s good, you can’t have a better time. 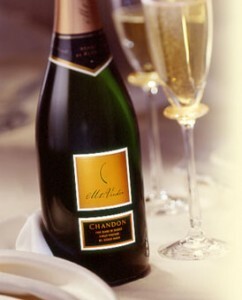 Chandon sparkling wines, like Domaine Carneros, are always reliable and very good value, but nothing special. Their Brut Classic at about $16 is made from Pinot Noir, Chardonnay, Pinot Meunier and Pinot Blanc, and is a real bargain. When I’ve got a lot of guests in a celebratory mood and prefer not to take a second mortgage, this is what I serve. But you can get that anywhere, so I recommend the Mt. Veeder Blanc de Blancs, available only at the winery, 100% Chard and four years on the yeast. Good stuff, that, mes amis. Chandon was one of the pioneers of sparkling wine in Napa (if you don’t count Schramsberg, which is in another league) and they bought acres and acres of vines in the early 1970s when the price was extremely cheap, a little more than $1000 an acre. Those acres could fetch hundreds of thousands each, today! As a result, they’ve been able to hang in there when other sparkling wineries went six feet under. Interestingly, early on, Chandon had a lot of help from John and Janet Trefethen of Trefethen vineyards, who make the best dry Riesling in the USA if you ask me. And you did. If the name seems familiar, it ought to be; the place was founded in 1973 by Moet-Hennessy, makers of Moet et Chandon’s “Dom Perignon“, named after a Benedictine monk. 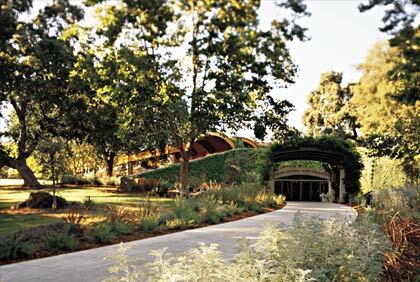 The tour at Chandon is maybe the best sparkling wine tour in California, and the winery itself really evokes a California spirit in its design and decor, as opposed to the garish facades of so many others. 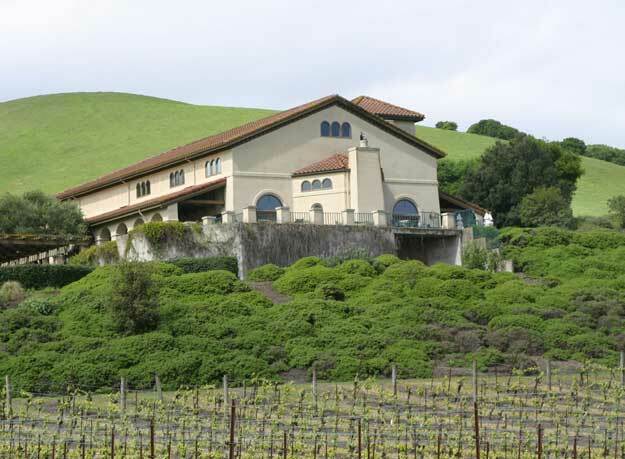 It’s stone and glass, built right into the hillside with lot of oak accents, and really is a comfortable, welcoming winery. In the French spirit they call their tasting room a “salon” and it’s open 10 to 6 daily. Stop in. That’s an interesting statement because Cosentino Signature Wineries (MCOZ.L) went live on London’s AIM Stock Exchange in 2006 and the ride’s been, well, bumpy is a kind way to say it. About a year ago Cosentino went on a shopping spree and bought St. Helena’s Lorenza-Lake Winery and its Blockheadia Ringnosii brand from founder Michael Ouellette. So it’s a good thing that consumers like you and I visit Cosentino to taste their wines and not examine their balance sheet. And while the tasting room/winery is an attractive building with ivy growing up the sides, it’s literally so close the road, you’ll often find yourself spitting gravel when arriving or pulling out of the parking lot. In a car, that is. But again, you’re there for the wines, not the winery. By the way, Mustard’s Grill is next door, a good place to dine if the staff is having a good day. Cosentino produces about 50,000 cases a year, not a big operation by Napa standards but far from a boutique. They’ve also got two other wineries – the CE2V label from the Pope Valley north of Napa, and Crystal Valley Cellars in Lodi. You can taste wines from all three in either the Napa or Lodi locations – $5 for a regular tasting and 10 bucks for the reserve, which is worth it, actually. Among the three labels they offer a lot of choices; too many, really, to be extrememly skilled in any – Red and White Meritage, Pinot Noir, Petit Syrah, a whole range of Zins with clever names, Sangiovese, Merlot, Sauvignon Blanc, the Napa standards of Cabernet Sauvigon and Chardonnay, and even a Gewurz. But three wines stand out for me – The Poet, MCoz, and the Late Harvest Viognier – and they are well ahead of this very large pack of varietals, labels and vintages. Oh, and give the white Meritage “The Novelist” a shot, and this one won’t break the bank.